Take advantage of this fantastic offer today! Buy any 3 packs from our selected socks range and get the cheapest pack for free! Don’t delay as this offer is only available while stocks last. Offer ends 31st July 2017. Terms and conditions apply* - please see below. Whatever the weather and whatever your need, we’ve got the perfect sock for you! Enjoy all-day comfort with premium-quality socks to suit everyone. Choose from cool socks, warm socks, Softhold® socks, knee-length socks, diabetic-friendly socks and extra roomy socks. 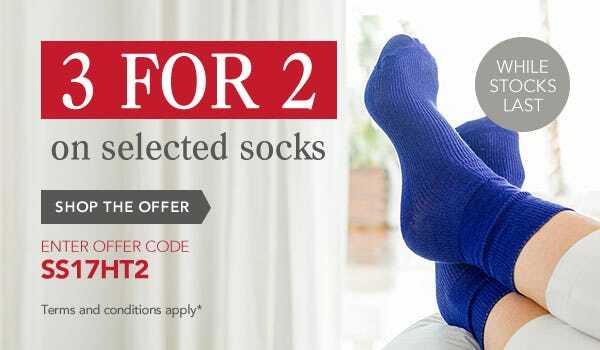 To take advantage of this great ‘3 for 2’ offer, simply add any 3 packs of socks from our selection to your basket and enter the offer code SS17HT2 when prompted. Offer only applies to in-stock items. *Terms and conditions: To redeem this ‘3 for 2’ sock offer, add at least 3 packs of socks to your basket and enter the code SS17HT2 when prompted. Offer only applies to socks featured in our socks selection category. Click here to view the socks selection. If purchasing multiple items, then the cheapest items will be free. Cannot be used in conjunction with any other offer. If you are returning items for a refund, all items must be returned to qualify. This offer expires at 11.59pm on 31st July 2017. Offer only applies to items that are in-stock. We reserve the right to withdraw this offer at any time.